"True love may fly into your heart!" GKids has debuted a new official trailer for their upcoming released of the Korean animated movie Satellite Girl and Milk Cow, or The Satellite Girl and Milk Cow / Uribyeol Ilho-wa Eollukso, from "the brilliant and slightly twisted mind" of writer & director Chang Hyung-yun. This film was actually released back in 2014 in Korea, and played at a few film festivals in 2014 and 2015, but is just now getting released in US theaters four years later. Satellite Girl and Milk Cow is described as "a heartfelt and wildly entertaining commentary on the possibility for human connection in the crazy, mixed-up, post-modern world we live in." GKids' president David Jesteadt is also excited about showing it to US audiences, saying it's "a truly original, fantasy anime sci-fi rom-com, just bursting with humor and heart. I'm hoping as many people as possible get the opportunity to see this remarkable film." This looks crazy fun. An out of commission satellite picks up a lovelorn ballad on her radio antenna and descends to Earth to find the source of such sincere emotions. But on the way she is caught in the crossfire of a raging magical battle and is transformed into Satellite Girl, complete with Astro Boy-like rocket shoes and weapon-firing limbs. Meanwhile, the balladeer in question – a loser 20 something at a café open mic – meets the fate that befalls all broken-hearted lovers: he is turned into a farm animal. But love knows no bounds, and aided by the wise and powerful Merlin – a wizard who has been turned into a roll of toilet paper – our duo must evade the all-consuming incinerator monster, the wily pig witch, and other nefarious adversaries in an attempt to be together. 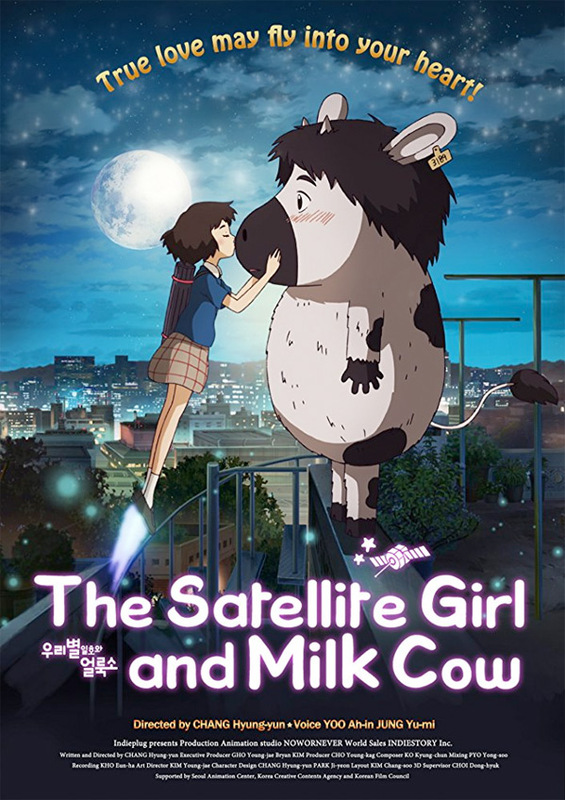 Satellite Girl and Milk Cow is both written and directed by Korean filmmaker Chang Hyung-yun, making his feature directorial debut after a few other animated short films/segments previously. This first opened in Korea in 2014, and played at the London Film Festival back in 2014. GKids is just now releasing Satellite Girl and Milk Cow in select theaters + on VOD later this summer. Anyone?